Outlook Connector (or Outlook Hotmail Connector) is an add-in for Microsoft Outlook which allows user to access, sync and manage Windows Live Hotmail email messages, People contacts, calendars and groups from within Outlook. Outlook Hotmail Connector is been updated with every new version of Office Outlook been released. The old version of Outlook Connector cannot be used with Outlook 2010 released as part of Office 2010. To connect to Hotmail emails, contacts, calendar, events, or Windows Live groups in Outlook 2010 final RTM which has the build version 14.0.4763.1000, an updated Outlook Connector for Office 2010 has to be downloaded and installed. 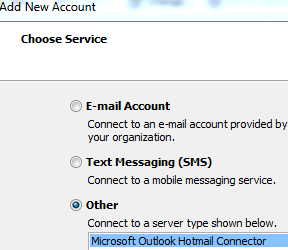 Tip: For users who just want to download emails from Hotmail to Outlook, Outlook Connection is optional and not necessary, as Hotmail now provides free POP3 and SMTP support. Outlook Connector is provided free of charge. Users who interested to download Outlook 2010 Hotmail Connector Pack via BitTorrent can use the following torrent instead. During the installation, there will be several errors saying the Outlook Social Connector is only for Office 2007 and 2003 only. Ignore the error as the Outlook Social Connect is already built-into Office 2010. Note that if you don’t upgrade Outlook Connector for Office 2010, an error “Outlook Connector cannot continue without Outlook 2003 or 2007” may be displayed.